Are you planning an educational class that can benefit from a graduation / completion reward? Did you issue new laptops or tablets? 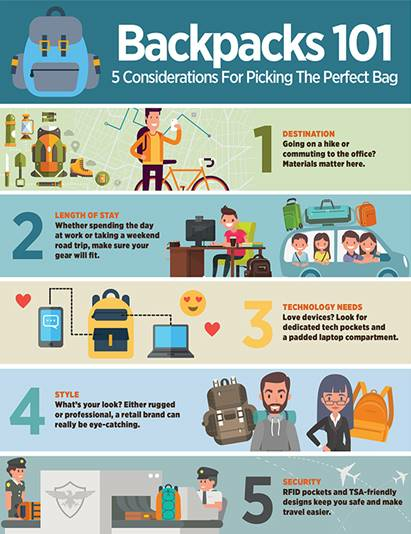 Is it time to replace your existing backpacks? Do you want to consider a promotion with an education or technology message targeted at your valued customers? Once you have read the visual to the left, shop our website or contact us with your 5 criteria and we will make product recommendations. Whether you have shopped our website yourself or ask us to make recommendations based on your 5 criteria, we will work with you to provide a quote and/or virtual sample of the bag featuring your artwork. Want to see a physical sample? We can order one for you. Our commitment is to make a difference for your company, your employees and the clients you serve. Contact us today to discuss how to optimize your branded merchandise with product strategies to extend your next brand experience in the hearts and minds of your employees and customers.